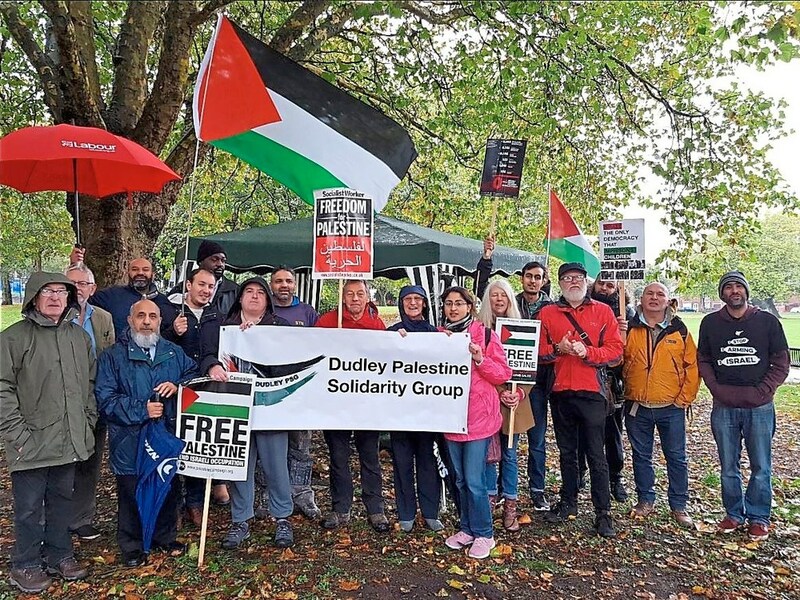 Paul Jonson had been suspended last month by Dudley council after having attended a protest outside the surgery of Ian Austin MP, who in July sent out a tweet stating “Hamas and the Palestinians were responsible for the deaths of 18 Gazans” during the Great Return March in May 2018. Comrade Jonson also published a post on Facebook declaring that “Israel is a racist endeavour” (in response to Labour NEC’s adoption of the ‘working definition’ of Anti-Semitism published by the International Holocaust Remembrance Alliance). Read Paul’s full statement explaining his case here. On December 19, the council found that comrade Jonson had “no case to answer” and he was allowed to return to work with immediate effect. This is an important victory in the fight against the highly politicised campaign that wants to label all criticism of Israel as ‘anti-Semitic’. We have written to all left candidates. We will publish all answers online as soon we receive them so that our members and supporters can decide who to nominate from their CLP and who to vote for when elections commence in November. Feel free to contact the candidates, too. We believe an active approach to candidates is much better than simply endorsing one or the other slate. The work of the National Constitutional Committee goes to the heart of LAW’s campaigning work – it deals with all disciplinary cases that the NEC feels it cannot resolve. Currently, a referral usually results in expulsion from the party. That’s why it is very important to choose candidates who will genuinely fight for members’ rights. We believe that this document has many shortcomings. Most seriously, we believe that some of the examples listed are conflating anti-Semitism with anti-Zionism and support for the rights of the Palestinian people. For example, one of the examples labels as anti-Semitic the description of Israel as a “racist endeavour”. We disagree. Opposing and criticising a state that systematically, and constitutionally, marginalises and demonises Palestinians while subjecting them to discrimination is by definition a form of apartheid. In our view, it is not anti-Semitism to state this fact. that the cases of all those who have been summarily expelled or suspended from membershipwithout due process within the last three years be reviewed for possible immediate reinstatement. We believe that the first part of rule 2.1.4.B (‘Exclusions’) should be abolished: it bars from Labour Party membership anybody who “joins and/or supports a political organisation other than an official Labour group or other unit of the party”. This rule has exclusively been used against left-wingers and Corbyn supporters. Almost 25% of delegates at Labour’s conference 2018 voted in favour of abolishing this rule. What is your attitude to it? – The preview will take place before an invited audience at a location in London. Please get in touch if you are interested in attending. 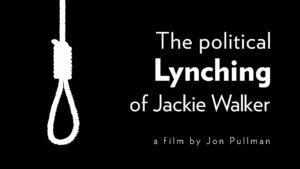 – More information will be widely circulated as part of publicity for a nationwide tour with director Jon Pullman, Jackie Walker and others. Dates and venues to be announced. Again, let us know if you are interested in putting on a showing locally. 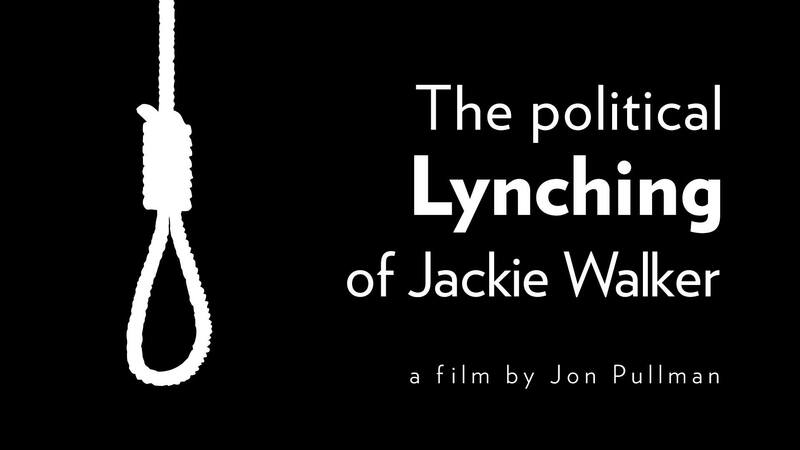 – Following the tour, the film will be made available on DVD for use by CLPs, trade unions and other groups. 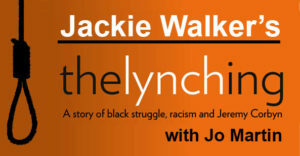 lynching of Jackie Walker’, had to be stopped a few minutes in. other victims of the witch-hunt – and interest in the film. 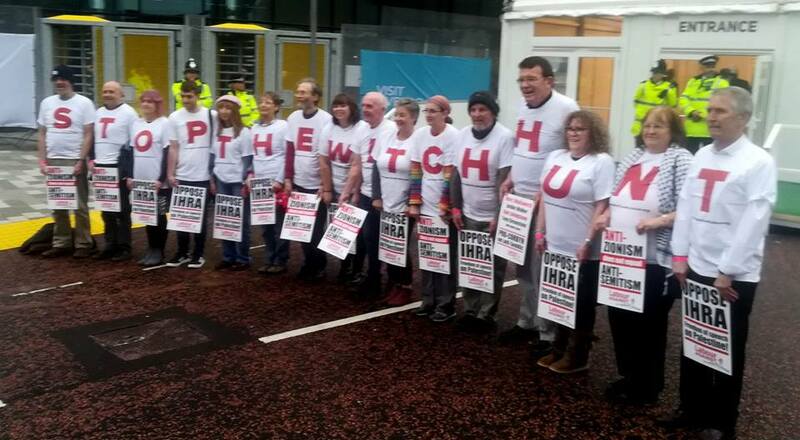 I send my solidarity and greetings to the fringe meeting of Labour Against the Witchhunt, and I’m sorry I couldn’t make it to join your panel on Sunday. 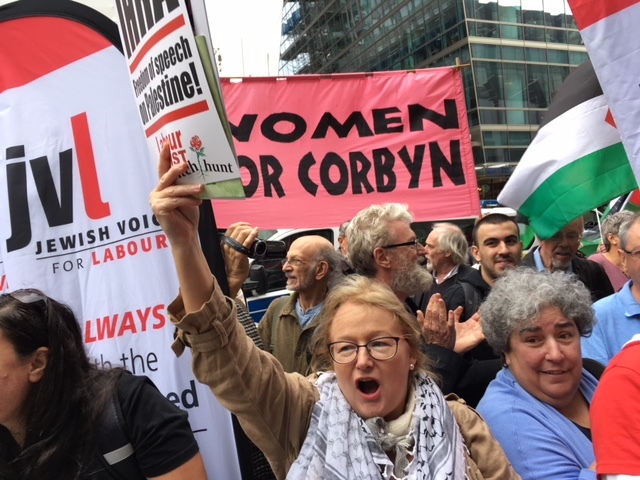 While some on the left may continue to delude themselves that the solution to the manufactured ‘Labour antisemitism crisis’ fabrication is to concede to the demands of the right and the Israel lobby by selling out on important principles, LAW is correct to insist that only a strong fight back by the party leadership — still sorely lacking — can put this dishonest and damaging strategy down for good. Be under no illusions — it is only a matter of time before this dishonest media narrative returns to daily headlines, as it has this entire summer. Despite the new left-wing general-secretary Labour has, the party bureaucracy is still disciplining members on entirely fallacious pretexts. One comrade in Brighton showed me a letter she received this very month from from Labour’s Head of Complaints Sophie Goodyear warning her that several “provocative” tweets she’d allegedly written in 2016 had “caused offence” and that such “abuse” would “not be tolerated” in Labour. What was her “offence”? One of the three tweets cited was simply the comrade posting the headline and link to my April 2016 article, “How Israel lobby manufactured UK Labour Party’s anti-Semitism crisis” without comment. Another tweet was a *condemnation* of antisemitism! The tweet criticised Chuka Umunna for conflating Zionism with all Jews. The comrade has thankfully not been suspended — so perhaps that is a small sign of progress thanks to the work of grassroots groups against the witch hunt, such as LAW. But it seems that at least some in Labour HQ are treating critical journalism like The Electronic Intifada as banned publications. Clearly much work remains to be done. Join us at Labour Party conference 2018! Are you planning on coming to Liverpool for Labour Party conference? Can you help us out with our intervention? Check out eight key events at conference below. We are at a crucial moment in the civil war in the party, with the witch-hunt against Jeremy Corbyn and the left in the party reaching ever new heights. We understand that in addition to their plans to force Corbyn’s hand on Brexit (there is a demo planned on Sunday afternoon) and the ongoing smears around Anti-Semitisn, the right is also planning on sabotaging conference wherever possible. 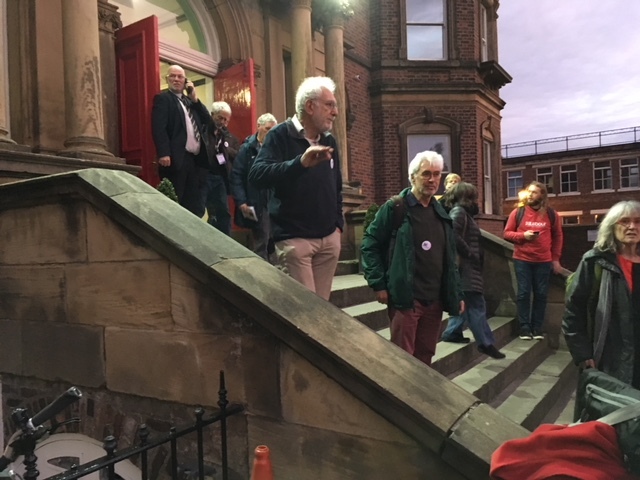 Please check out this article, which also mentions that there are plans to disturb any meetings with Chris Williamson MP. We therefore have to remain somewhat flexible, but also vigilant. Please do not get drawn into altercations and do not let right-wingers provoke you. We know they will try and they will in all likelihood have somebody with a camera nearby. They will want to make us look like dangerous lunatics – let’s not do them the favour. Try and stay together with at least one other person, so you have a witness and some form of protection. Keep your mobile phone nearby so you can film any incidents – best to have evidence! 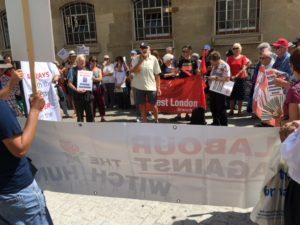 If you can help out, please email info@labouragainstthewitchhunt.org, letting us know if you’re a delegate or visitor (or neither), when you’ll be arriving and when you are leaving – make sure to include your mobile number! Facebook event here. We are handing out LAW leaflets and badges throughout the event, but here our are key interventions – can you be there? Please note that all of our events are outside the official conference venue, so you don’t need to have a pass for conference to attend. You also do not need to purchase a ticket upfront – just be there early enough to secure your place! 3) Saturday September 22, from 6pm: Rally and briefing session of Campaign for Labour Party Democracy. Friends Meeting House, 22 School Ln, Liverpool L1 3BT. We need comrades to help hand out our leaflet. 4) Sunday September 23, from 8.30am, outside conference. We are greeting delegates and visitors as they arrive, with a little surprise – we need as many comrades as possible to come to this. 5) Sunday September 23, 12noon, ‘People’s Vote’ demonstration, from St George’s Hall to the Pierhead. Left-wing voices should be heard here, too. 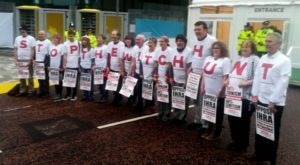 Fringe event at Labour Party Conference: Labour Against the Witchhunt! Introduction and post-show discussion by Graham Bash (Jewish Voice for Labour) and John Pullman, director of the film. The wording of recent pre-disciplinary warning letters being sent to Labour Party members from Sophie Goodyear, “Head of Complaints” at Labour’s HQ in Southside, shows that the witch-hunt of socialists in the party continues unabated, albeit in a modified form – particularly against those who forthrightly challenge the racism inherent in Zionist ideology and Israel’s apartheid laws and practices. Iain McNicol’s notorious “Complaints Unit” appears to have been replaced, under Jennie Formby and legal guru Gordon Nardell, by a “National Complaints Team” – but the stench of hypocrisy reminds us that a rose, by any other name, would smell as sweet. Healthy discussion of political issues is still being blocked by chilling complaints which are, all too often, taken seriously. Instead of debating the content of differences, the right make complaints about the manner of expression. Instead of stating their views openly in the press, on social media and in party meetings, the right make cowardly complaints to party officials. The good news is that automatic exclusions, disciplinary action before due process, appears to have ended – one of the key demands of Labour Against the Witchhunt at its formation in October 2017. At least in some cases, suspension from membership is no longer the first resort of the party’s apparatchiks. Suspension normally involves removal from all posts. This not only removes the rights of the suspended member, but also directly negates the democratic rights of the party members who elected them to those posts. It also involves a ban on attending party meetings, thereby removing the best form of education and re-education – discussion of a member’s issues with their peers, their comrades in their local branch and constituency party. “It has been brought to the attention of the National Complaints Team that you have posted offensive comments on your social media, copies of these are included in this letter. These comments have caused offence. 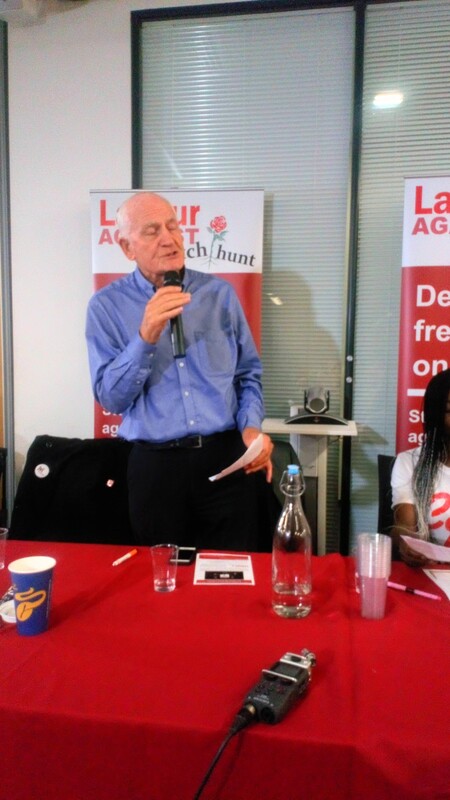 “The Labour Party should be the home of lively debate, of new ideas and of campaigns to change society and we appreciate that this does lead to discussions where those involved hold differing opinions. For a fair debate to take place, people must be able to air their views in a safe space and an atmosphere of respect. Abuse of any kind – whether direct attacks or pejorative language which may cause offence – is not acceptable and will not be tolerated in our Party. Language that may be perceived as provocative, insensitive or offensive falls short of the standards expected of us as Party members. Being found guilty without due processand threatened with future disciplinary action chills the heart of the accused, but leaves them none the wiser as to what exactly is deemed unacceptable in what they have said. Attaching copies of one’s “social media comments” still leaves one guessing, afraid and silenced. (c) Raise the issue in your party branch or constituency meeting. 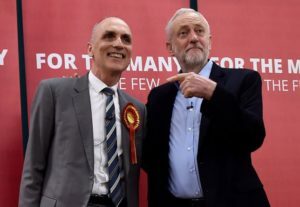 The September 4 decision of Labour’s National Executive Committee to back the full IHRA definition of anti-Semitism is a gift to the right in party. The intent of this document is not to define Anti-Semitism – after all, the Oxford English Dictionarymanages that in six words: “Hostility to or prejudice against Jews.” No, its sole purpose is to conflate criticism of Zionism and Israel with anti-Semitism. 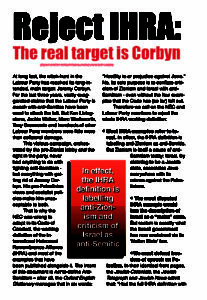 Most IHRA examples refer to Israel and the IHRA definition is labeling anti-Zionism and criticism of Israel as anti-Semitic. Including Jeremy Corbyn, of course. At long last, the witch-hunt in the Labour Party has reached its main target. For the last three years, vastly exaggerated claims that the Labour Party is awash with anti-Semites have been used to attack the left. But Ken Livingstone, Jackie Walker, Marc Wadsworth, Tony Greenstein and hundreds of other Labour Party members were little more than collateral damage. 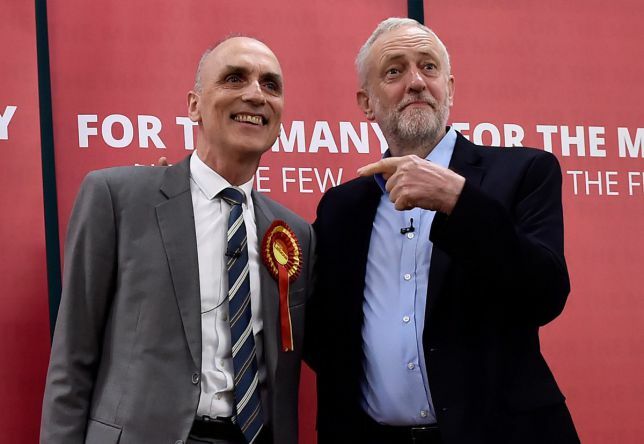 This vicious campaign, orchestrated by the pro-Zionist lobby and the right in the party, never had anything to do with fighting anti-Semitism – but everything with getting rid of Jeremy Corbyn. His pro-Palestinian views and socialist policies make him unacceptable to both. And now the NEC – on paper dominated by the pro-Corbyn left – has given in once again. Momentum owner Jon Lansman has been lobbying for the adoption of the full IHRA – and he presumably was behind moves to stop even Jeremy Corbyn’s ‘personal statement’, which would have qualified some of the ‘examples’. But Corbyn was told that there “wasn’t a majority for it”. One thing is for certain. 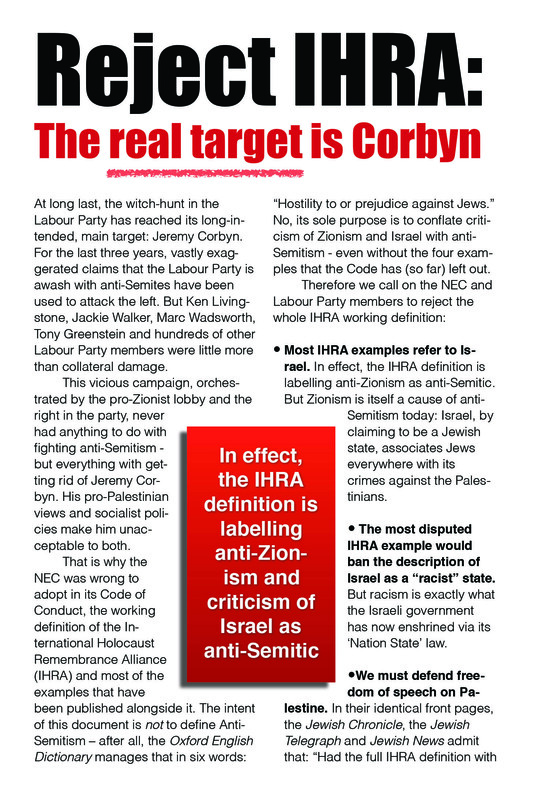 The IHRA will not stop the fake anti-Semitism campaign. On the contrary the NEC’s decision has given it renewed strength. It is time to take a principled stance. 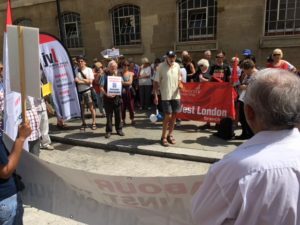 The joint demonstration on September 4 by Jewish Voice for Labour, Labour Against the Witchhunt and the International Jewish Anti-Zionist Network was magnificent. 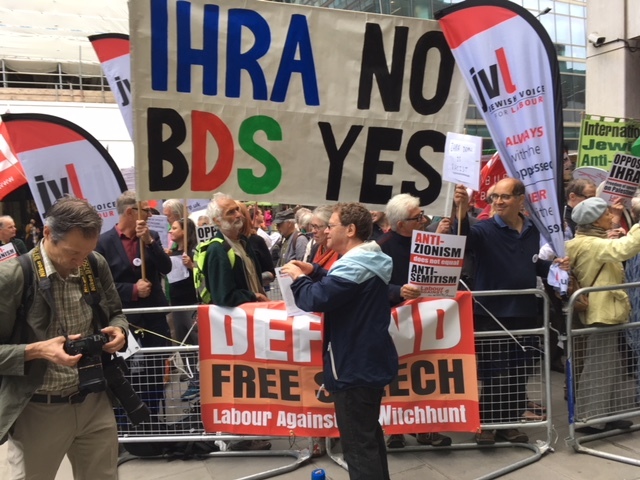 Over 200 people turned up to show their opposition to the IHRA and to demonstrate their anger at the false accusations of anti-Semitism. A number of Momentum groups were present, as Lansman slunk in without saying a word. Click here for our report. They have to reject the whole IHRA working definition and clearly say that the Labour Party is not riddled with anti-Semites. All those summarily expelled or suspended from membership without due process should be immediately reinstated. We need mandatory reselection of all Labour MPs. The right wing saboteurs in the PLP have to go. 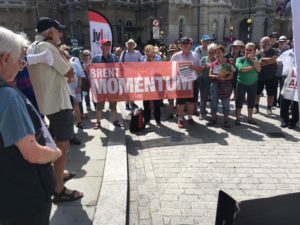 Momentum has be radically democratised – or abolished.Instead of defending Corbyn, Momentum owner Jon Lansman has sided with the witch-hunters. He has thrown Jackie Walker and Pete Willsman to the wolves and is now ready to abandon Corbyn, too. He wants the term ‘Zionism’ banned. He runs Momentum like a dictator, having abolished all democratic structures. But democracy and free speech are essential in the struggle to transform our party and society. 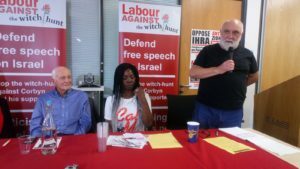 NEC lobby: no to IHRA, yes to freedom of speech! You can download the leaflet here in PDF format. At long last, the witch-hunt in the Labour Party has reached its long-intended, main target: Jeremy Corbyn. 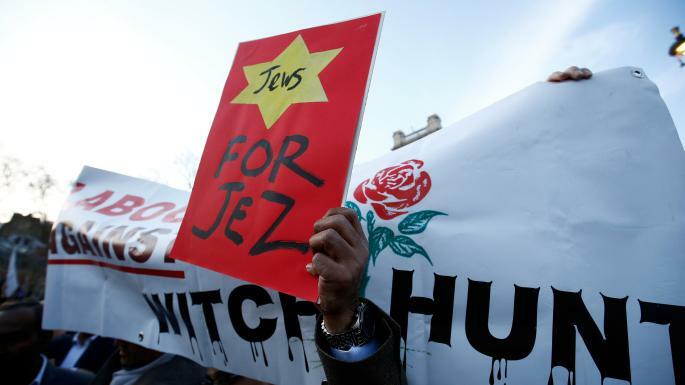 For the last three years, vastly exaggerated claims that the Labour Party is awash with anti-Semites have been used to attack the left. But Ken Livingstone, Jackie Walker, Marc Wadsworth, Tony Greenstein and hundreds of other Labour Party members were little more than collateral damage. That is why the NEC was wrong to adopt in its Code of Conduct, the working definition of the International Holocaust Remembrance Alliance (IHRA) and most of the examples that have been published alongside it. The intent of this document is not to define Anti-Semitism – after all, the Oxford English Dictionary manages that in six words: “Hostility to or prejudice against Jews.” No, its sole purpose is to conflate criticism of Zionism and Israel with anti-Semitism – even without the four examples that the Code has (so far) left out. Most IHRA examples refer to Israel. In effect, the IHRA definition is labelling anti-Zionism as anti-Semitic. But Zionism is itself a cause of anti-Semitism today: Israel, by claiming to be a Jewish state, associates Jews everywhere with its crimes against the Palestinians. The most disputed IHRA example would ban the description of Israel as a “racist” state. But racism is exactly what the Israeli government has now enshrined via its ‘Nation State’ law. Any attempts by the NEC to introduce so-called ‘safeguards’ are doomed to fail. Not only would they compete with the IHRA examples (which rule is more important?). Any assurance that past comments would not be investigated are also useless, because Jeremy Corbyn has already been declared an anti-Semite. We need mandatory reselection of all Labour Party MPs. The right wing saboteurs in the PLP have to go. 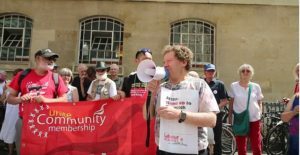 Momentum has be radically democratised – or abolished. 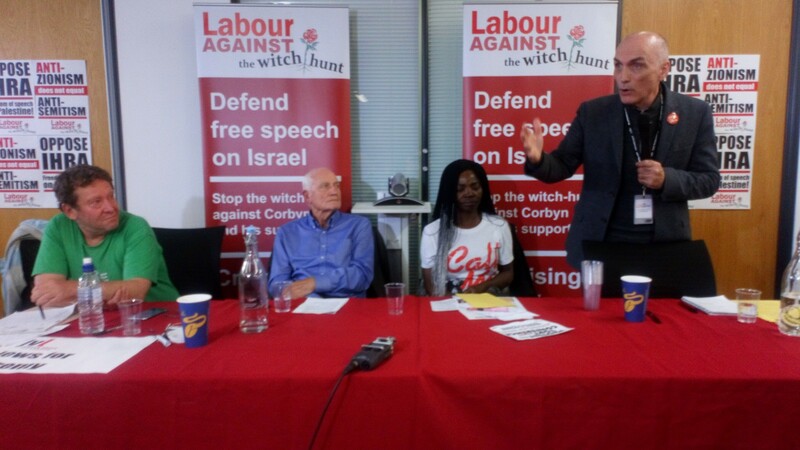 Instead of defending Corbyn, Momentum owner Jon Lansman has sided with the witch-hunters. He has thrown Jackie Walker and Pete Willsman to the wolves and is now ready to abandon Corbyn, too. He wants the term ‘Zionism’ banned. He runs Momentum like a dictator, having abolished all democratic structures in his coup of January 10 2017. Mass lobby on September 4: Say no to IHRA examples! 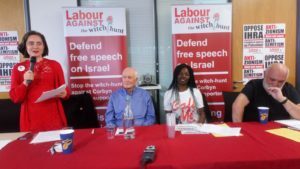 On September 4, the National Executive Committee of the Labour Party will be discussing the adoption of ALL examples of the definition on Anti-Semitism published by the International Holocaust Remembrance Alliance (IHRA). Most of these examples are designed to conflate criticism of Israel with Anti-Semitism. If adopted, they would, for example, ban the description of Israel as a racist state. We believe that adopting these examples would be major defeat for the left. That is of course what this whole campaign is about: to get rid of Corbyn and his supporters and to stop the transformation of the Labour Party into a vehicle for socialist change. For this, we need a culture of open debate and criticism, not a culture of fear and censorship. As socialists, we must defend the right to openly criticise the crimes and injustice committed against the Palestinians. We call on NEC members to resist this pressure from the right in and outside the party. We are therefore joining other organisations and groups in calling for a mass protest outside Labour Party HQ. Bring banners, posters and witches costumes! LAW’s leaflet for the event is available here in PDF format. 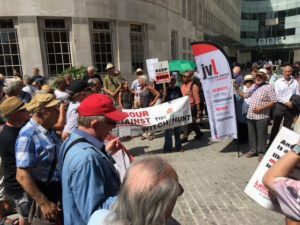 Over 100 people attended a spirited lunchtime demonstration outside BBC Brodcasting House on August 7, which was called to protest against the ‘Biased Broadcasting Cooperation’ and particularly the way in which it has reported about the ‘anti-Semitism scandal’ in the Labour Party. 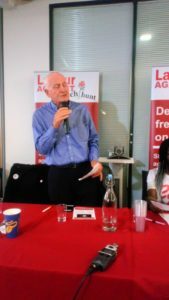 Glyn Secker, secretary of Jewish Voice for Labour, tried to hand in a letter to the BBC.An agreement had been made the day before for a delegation of four people to deliver this letter of protest and that someone from the BBC would meet the delegation in order to receive the letter. 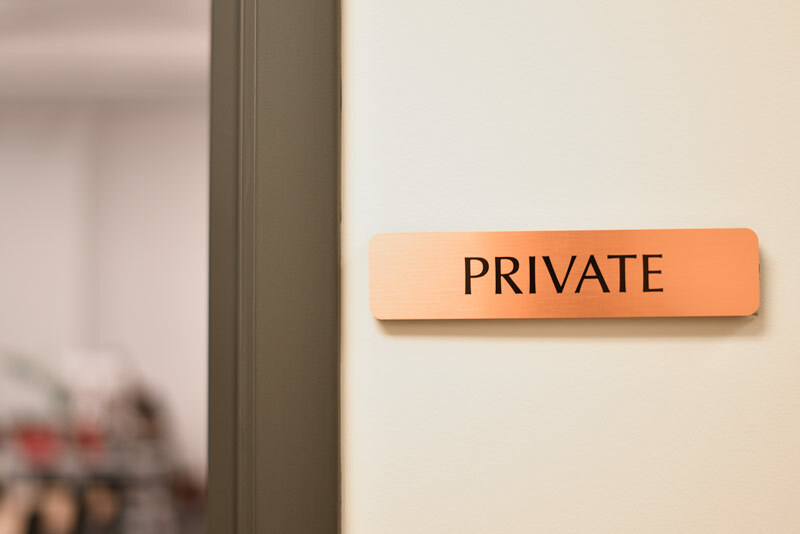 When it came to it however, a security guard took the letter outside the building, promising to hand it to another security guard who would then deliver it to the addressee. “Every appeasement, every apology by Corbyn is immediately followed by fresh right wing attacks. The witch-hunt is not about to end. It is not about anti-Semitism, it is about removing Corbyn, because he is an unreliable ally of the United States and Israel. The hypocrisy of Labour’s rightwing is breathtaking. Disciplinary action against Margaret Hodge has been dropped. 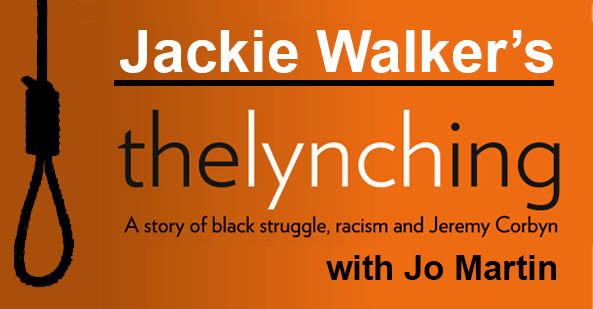 So we want to see the charges against Jackie Walker dropped, we want Marc Wadsworth, Tony Greenstein and Cyril Chilson reinstated. We want Ken Livingstone invited to re-join the party.